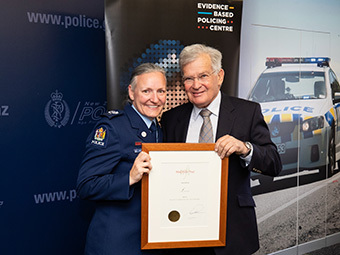 The Woolf Fisher Police Fellowship programme (established in September 2017) awards up to 15 constabulary and non-constabulary employees each year for their excellence and dedication to NZ Police with a certificate and funding for international travel and study. The primary purpose of the Fellowship is to promote better and more efficient policing for the benefit of our communities. Recipients of the Fellowship are funded to travel and study abroad. Their study may include observation of policing practices in overseas jurisdictions or participation in a pre-agreed course of study (or both). Fellows are required to report back on their learning on their return. The Fellowship provides funding to cover travel, study and associated costs of the fellow and an accompanying spouse or partner (if any). Senior Sergeant Lyle Norriss, Auckland and Sir Noel Robinson, Chairman of the Woolf Fisher Trust. For more information, go to the Woolf Fisher Trust website.